Built in 1852 as the hub for the Great Northern Railway. 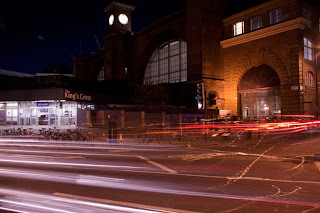 The station and the area of Kings Cross named after King George IV. Urban folklore is that this was the site of Queen Boudica's final battle and that her body lies somewhere under the current platform 10. Kings X at night? You are brave! That would put her right near platform 9 3/4. Just happened upon your theme. Great idea! I'm moving back to London in July, so loving the inspiration from your Monopoly photos (and others). Fantastic shot of a place which leaves me with some sadness.